The big reveal has occurred. After months of speculation and debate, we now know who has a place in the Oscar race. 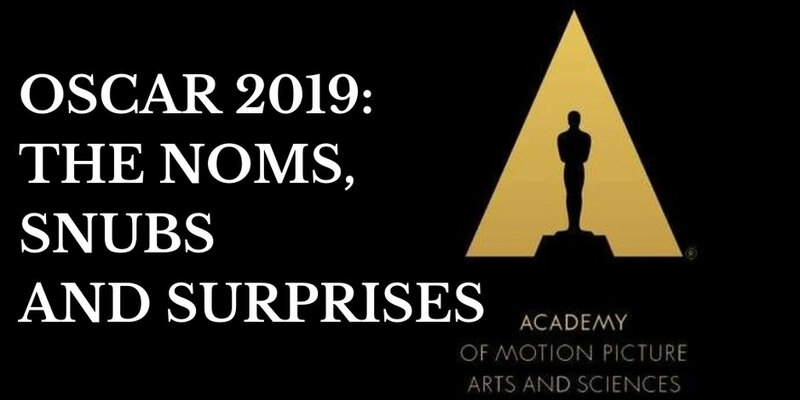 The nominations for the 91st Academy Awards proved to be a dramatic event in itself - featuring (as they always do) both snubs and surprises. A truly eclectic mix of films form the category for Best Picture. There were no real shocks here - just a collective, disappointed sigh that the list failed to include (my favourite film of 2018) Leave No Trace or any film directed by a woman for that matter. Black Panther’s nomination (the first Best Picture nod for a superhero film) was very well received. However, it was the inclusion of Spike Lee’s BlacKkKlansman that gave me all the feels - a timely and deserving nomination. I have not watched At Eternity’s Gate but am always glad to see Willem Dafoe recognised. However, I am disappointed that Ethan Hawke failed to get a nomination. His performance in First Reformed is breathtaking. What an incredible category. Incredible.Yalitza Aparicio’s story is utterly compelling. I would love for Olivia Colman to win here, my heart is with Glenn Close (particularly after her powerful and poignant Golden Globes acceptance speech). I was so relieved to see Sam Elliott’s nomination for Best Supporting Actor. He gives an incredible performance in A Star Is Born. Meanwhile, Sam Rockwell’s nod for Vice caused some consternation. I would have preferred to have seen either Timothée Chalamet (for Beautiful Boy) or Michael B. Jordan (for BlacKkKlansman). Meanwhile, the early money seems to be on Mahershala Ali for his role in Green Book. I am so thrilled to see Oscar recognition for Regina King. She is superb in If Beale Street Could Talk. Superb. Nods for Amy Adams, Emma Stone and Rachel Weisz were expected. Marina de Tavira's nom (for Roma) was a real surprise - but so well deserved. My favourite performance is still Toni Collette in Hereditary, however. So happy for Spike Lee. An icon in the world of film for so many years, this is nomination is long overdue. I do feel sad for Bradley Cooper, however. I would be so love any one of these films to win Best Adapted Screenplay. My heart, however, is with If Beale Street Could Talk. Dolly Parton’s loss (for Dumplin’) is The Ballad of Buster Scruggs’s gain. I was so glad to see Carter Burwell’s nomination in Best Original Song. It is great to see recognition for Nicholas Britell and his wonderful work on If Beale Street could talk. I also love Ludwig Goransson’s Black Panther score. Meanwhile, I feel shocked and really sad that Justin Hurwitz was snubbed for his incredible First Man score. So, so glad that Spider-Man: Into The Spider-Verse has been given a nomination. It deserves the recognition and, if I was in charge, the Oscar. Dear Academy, please (pretty please) could you allow more films to be included in this category? I don’t want to bump any of these documentaries but would have loved to have seen Three Identical Strangers, McQueen, Won’t You Be My Neighbor and Shirkers added to the nomination list. Until then, RBG and Free Solo look like the frontrunners here. I have not seen Never Look Away but (from the trailer) it looks absolutely stunning. I cannot wait to watch this film. Dominated by foreign language movies, this is a tough and competitive category. Cold War and Roma are both incredibly beautiful films and I would expect one of these two to win (and it will probably be Roma). The costume design in all of these films is stunning. However, while I love Alexandra Byrne’s work in Mary Queen of Scots, Sandy Powell’s designs surely make The Favourite the, erm, favourite in this category. While Christian Bale looks incredible in Vice, I would like this Oscar to go to Mary Queen Of Scots. Sad that Stan and Ollie didn’t get any recognition here. Wow, what an impressive and, again, eclectic selection of films. While a case could have been made for Crazy Rich Asians and Fantastic Beasts, I am so happy with this category. Oddly devoid of Best Picture nominees, Best Visual Effects is another impressive category (although I would have loved to see Black Panther and Mary Poppins here too). I am hoping that the lack of love for First Man will be rectified here. However, I would be happy with any win… apart, perhaps, Solo: A Star Wars Story. I would have liked to have seen First Man in this category. Meanwhile, having missed out on this and Best Director, A Star Is Born’s chances of winning Best Picture have well and truly nosedived. Good to see A Quiet Place in this category. It feels good that this is now officially an Oscar-nominated film. However, I think First Man is the front-runner here. The sound mixing in each of these nominated films is exceptional. For me, A Star Is Born takes the prize as the sound mixing in this film is stunning. I am embarrassed to report that I have only seen two of the Oscar nominated shorts. However, I do intend to put this right asap. Meanwhile, I can report that I loved Bao and found End Game (available on Netflix) incredibly powerful. Toni Collette should absolutely have been nominated for Hereditary. Women In Film - once again, the Oscar nominations were dominated by male filmmakers. Come on Academy - in a year with Leave No Trace and You Were Never Really Here (to name but two) this is no longer acceptable. After widespread critical and audience acclaim, Won’t You Be My Neighbor failed to secure a nomination. It would have been in my list, as would Three Identical Strangers… am just not sure what I would want to replace, however. Widows - Steve McQueen’s film deserved to be recognised by the Academy. Mission Impossible - if ever there was a film to reward this incredible franchise, it was surely Fallout. Bradley Cooper - I was so impressed by Bradley Cooper’s directorial debut. I would have loved for him to get a nomination. What do you think about the nominations for this year’s Oscars? Let me know in the comments section below or over on Twitter. You can find me @500DaysOfFilm.